Mystery shrouds the birth of our universe. In a fraction of a second, the universe transformed from a size smaller than a subatomic proton through expanding exponentially faster than the speed of light, according to the Big Bang theory. At the heart of this event lies the explanation for all the constituents of the cosmos today. If the moment of the Big Bang can be understood, we may finally have the theory of everything that can reconcile the quantum Standard Model of particle physics with Einstein’s general theory of relativity, which holds that gravity is a result of the curvature of space and time. Even the most powerful particle physics experiments on Earth don’t have enough clout to recreate the conditions in the early universe. We can find evidence of them, however, in the cosmic microwave background (CMB), which functions like a fossil remnant of that very early universe, says Rachel E. Bean, Astronomy. In an effort to understand physics at those extreme properties, Bean looks for tiny temperature fluctuations in the CMB. These were generated a trillionth of a second after the Big Bang during a process called primordial inflation when the universe is thought to have expanded faster than the speed of light for a brief time. “We have to describe how quantum properties behave with gravity and space and time,” says Bean. “We don’t know how to do that. The only way we can try to figure this out is to look at these very early moments.” Bean hopes to connect these temperature fluctuations in the CMB to one of the potential theories—especially string theory—that are candidates to reconcile quantum mechanics and the general theory of relativity. The CMB can also tell scientists about the effects of gravity on objects through time. Astronomers will be able to do that in unparalleled detail over the next decade when four new telescopic surveys come online. These large-scale structure surveys will look at millions to billions of galaxies. They will either take multicolor images of them, revealing through color different physical properties, or they will record the galaxies’ spectra, the emission or absorption lines of light of particular wavelengths, which pinpoint the galaxies’ positions in space. “We’re going to be able to survey out billions of light years to be able to understand the structure of our universe with unprecedented precision,” Bean says. Two of the telescopes will be ground-based and two will be space-based. Bean is the leader of an international collaboration of approximately 500 scientists—the LSST Dark Energy Science Collaboration—that will be using the data from one of the ground-based photometric imaging telescopes, the Large Synoptic Survey Telescope (LSST), which is an international venture led by two United States agencies, the National Science Foundation and the United States Department of Energy. The LSST will share the ground-based spotlight with another state-of-the-art telescope, the Dark Energy Spectroscopic Instrument (DESI), a United States Department of Energy initiative, which will come online in 2019. The final two telescopes, both space-based, will be launched in the next decade: the European Space Agency’s Euclid in 2021 and the National Aeronautics and Space Administration’s Wide Field Infrared Survey Telescope (WFIRST) in the mid-twenties. Euclid, ESA’s Dark Universe mission, has passed its preliminary design review, providing confidence that the spacecraft and its payload can be built. It’s time to start ‘cutting metal’. 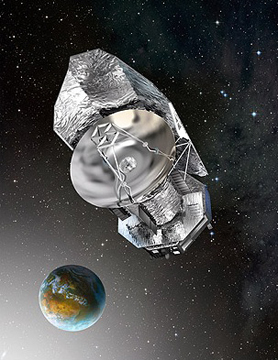 First proposed to ESA in 2007, Euclid was selected as the second medium-class mission in the Cosmic Vision programme in October 2011. Italy’s Thales Alenia Space was chosen as the prime contractor in 2013. Since then, the mission’s design has been studied and refined. This has involved a wide range of detailed technical designs, in addition to building and testing key components. The outcome of Euclid’s recent review was positive, opening the door to the industrial contractors and external instrument teams building the spacecraft and payload for real. Airbus Defence & Space in France will deliver the complete payload module incorporating a 1.2 m-diameter telescope feeding the two science instruments being developed by the Euclid Consortium. “This is a major milestone for us. Everyone is now ready to start cutting metal,” says René Laureijs, Euclid’s project scientist. On the scientific side, this review checked that the mission can indeed deliver the required data. The combined performance of the spacecraft, telescope and instruments shows that the data returned over the six-year mission will achieve the objectives. Euclid is designed to give us important new insights into the ‘dark side’ of the Universe, namely dark matter and dark energy, both key components of the current model for the formation and evolution of the Universe. Observations made over recent decades reveal that less than 5% of the matter in the Universe is in the form of normal atoms, while a much larger amount of dark matter is inferred from measurements including the rotation speeds of galaxies. This matter acts through gravity, but is invisible. Dark energy, on the other hand, is invoked to explain the finding that the expansion of the Universe is accelerating. Although they are thought to make up the majority of the matter and energy in the Universe, dark matter and dark energy cannot be seen. Instead, their presence is inferred by the movement of galaxies, the shape of galaxies, their distribution in space, and the rate of the Universe’s expansion as traced by the galaxies. By mapping the shapes, positions and movements of two billion galaxies across more than a third of the sky, Euclid will provide astronomers with an unprecedented wealth of data to analyse. The unrivalled accuracy of its measurements will allow them to close in on the properties and behaviour of dark matter and dark energy. This, in turn, will put constraints on the theoretical properties of what these two unseen components of the Universe may be. With Euclid’s preliminary design review now safely passed, the next major milestone comes in two years at the critical design review. At this point, the major hardware components will have been built and tested. If all goes well, Euclid will then be assembled. After this, Euclid will be ready for launch in December 2020 on a Soyuz rocket from Europe’s Spaceport in Kourou, French Guiana. “The construction of ESA’s Euclid space mission to explore the ‘dark Universe’ will be led by Italy’s Thales Alenia Space as prime contractor, beginning the full industrial phase of the project. The announcement follows that of last month when Astrium Toulouse was confirmed to build the payload module – the telescope and optical bench carrying the science instruments. Euclid will be launched in 2020 to explore the roles played by dark energy and dark matter in the evolution of the Universe since the Big Bang and, in particular, in its present accelerating expansion. Dark matter is invisible to normal telescopes, but acts through gravity to play a vital part in forming galaxies and slowing the expansion of the Universe. Dark energy, on the other hand, causes a force that overcomes gravity and that is accelerating the expansion seen around us today. Together, they are thought to comprise 95% of the total amount of mass and energy in the Universe, with ‘normal’ matter – from which stars, planets and we humans are made – making up the remaining small fraction. But their nature remains a profound mystery. ‘We are pleased to confirm the prime contractor for this exciting mission. 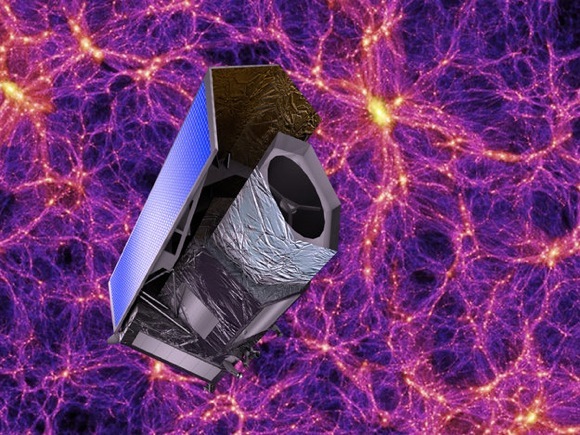 With the support of European space industry, we are a step closer to revealing the darkest secrets of the Universe,’ says Professor Alvaro Giménez, ESA’s Director of Science and Robotic Exploration. ‘This is a long-awaited milestone after the mission concept was first proposed to ESA in 2007, and we are delighted to see that the spacecraft construction can now begin,’ says Yannick Mellier, who leads the Euclid consortium, comprising scientists from 13 European countries and the US. The consortium will provide Euclid’s two state-of-the art scientific instruments: a visible-light camera and a near-infrared camera/spectrometer. Together, they will map the 3D distribution of up to two billion galaxies spread over more than a third of the whole sky. Light from the most distant galaxies streaming towards Earth is slightly bent by gravity as it interacts with matter along the way. This is dominated by dark matter, whether associated with galaxies and galaxy clusters, or in isolation. Thus, by measuring distortions in the shapes of those background galaxies, astronomers can construct a 3D map of the dark matter in the Universe. Furthermore, by assessing how the distribution of galaxies and galaxy clusters has changed over cosmic time, scientists can infer the role and evolution of dark energy from the dawn of the Universe until today. 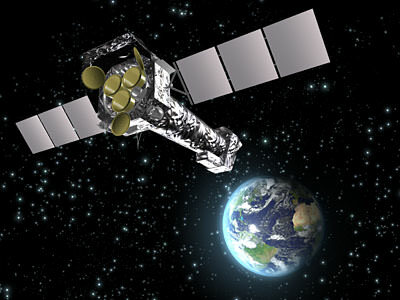 See the full article http://www.esa.int/Our_Activities/Space_Science/Thales_Alenia_Space_kicks_off_Euclid_construction. 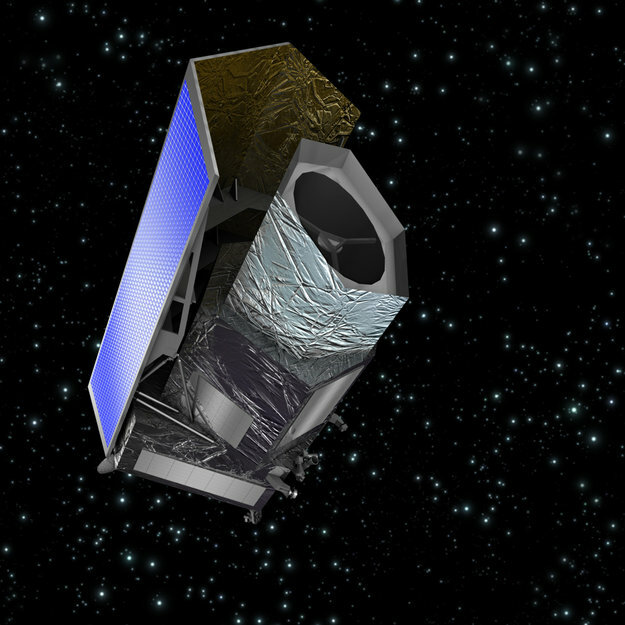 “The European Space Agency (ESA) has selected three NASA-nominated science teams to participate in their planned Euclid mission, including one team led by NASA’s Jet Propulsion Laboratory in Pasadena, Calif.
NASA is a partner in the Euclid mission, a space telescope designed to probe the mysteries of dark energy and dark matter. Euclid is currently scheduled to launch in 2020. JPL will provide 16 advanced infrared detectors and four spare detectors for one of two instruments planned for the mission. In addition, JPL will contribute to science planning and data analysis with the help of its 43-member science team, the largest of the three U.S. teams. This team, led by JPL scientist Jason Rhodes, is composed of 29 scientists recently nominated by NASA, and 14 U.S. scientists who are already part of Euclid. Rhodes also was appointed by NASA to be a member of ESA’s principal 12-member Euclid Science Team and the U.S. representative for the Euclid Consortium’s governing body. The Euclid Consortium is an international body of 1,000 members, including the U.S. science team members, and will build the instruments and analyze the science data jointly. Euclid will observe up to two billion galaxies occupying more than one-third of the sky with the goal of better understanding the contents of our universe. Everyday matter that we see around us, for example in tables and chairs, people and even stars, makes up only a few percent of everything in our cosmos. If you could fill a bucket with the mass and energy contents of our universe, this everyday matter would fill only a small fraction. A larger amount, about 24 percent, would consist of dark matter, an invisible substance that does not reflect or emit any light, but exerts a gravitational tug on other matter. The other two U.S. science teams are led by Ranga-Ram Chary of the Infrared Processing and Analysis Center at the California Institute of Technology, Pasadena; and Alexander Kashlinsky of NASA’s Goddard Space Flight Center, Greenbelt, Md. ; with three and seven members, respectively. 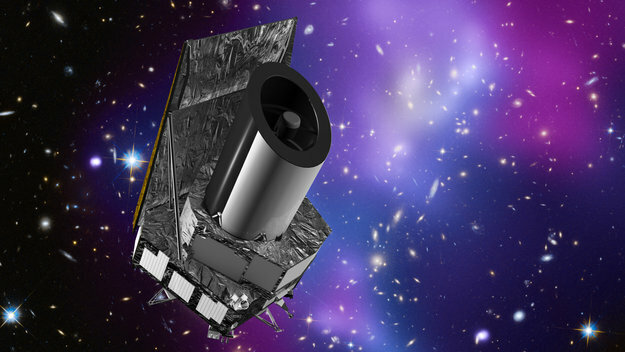 “NASA has officially joined ESA’s Euclid mission, a space telescope designed to investigate the mysterious natures of dark matter and dark energy. To be launched in 2020, Euclid’s 1.2 m-diameter telescope and two scientific instruments will map the shape, brightness and 3D distribution of two billion galaxies covering more than a third of the whole sky and looking back over three-quarters of the history of the Universe. Scientists hope to solve key problems in our understanding of the evolution and fate of our expanding cosmos: the roles played by ‘dark matter’ and ‘dark energy’. NASA recently signed a Memorandum of Understanding with ESA outlining its contribution to the mission. The US agency will provide 20 detectors for the near-infrared instrument, which will operate alongside a visible-wavelength camera. The instruments, telescope and spacecraft will be built and operated in Europe. NASA has also nominated 40 US scientists to become members of the Euclid Consortium, who will build the instruments and analyse the science data returned from the mission. The consortium already includes almost 1000 scientists from 13 European countries and the US. Dark matter, unlike most of our own planet’s little “mysteries,” is a real enigma with big potential.